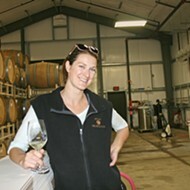 The Kinney San Luis Obispo and Leroy's is located at 1800 Monterey St. in SLO. 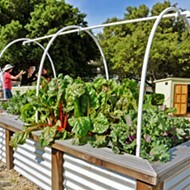 For more information, call (805) 544-8600 or go to thekinneyslo.com. If you are immune to nostalgia, you might pass by the vintage Skee-Ball machine without even a second glance. However, if you're like me, you may find it harder to pass up the giant Lite-Brite glowing in the back patio. My inner-child squealed at the sight of this old-school game, a direct import from my third grade bedroom. 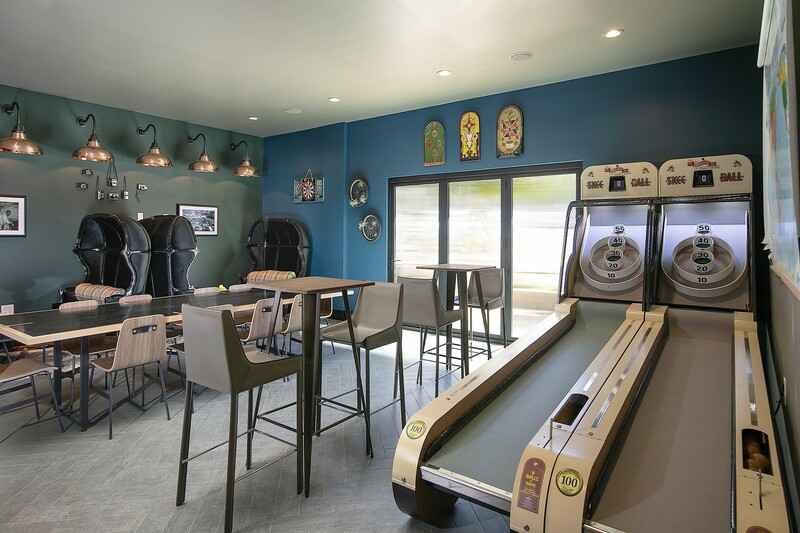 STAY, PLAY, OR EAT Skee-Ball, giant Lite-Brite and Scrabble—plus a host of creative, approachable menu items like chicken and waffles and a shiitake basil turkey burger—make Leroy's more than your average "hotel restaurant." This is the sneaky surprise of Leroy's, the new restaurant attached to The Kinney Hotel at 1800 Monterey St. You think it's just going to be some bland new corporate cafeteria, but then it hits you in all the sweet spots. The completely remodeled boutique hotel checks off all the requirements for a cool, modern space: custom neon in the lobby, AstroTurf in "the quad," mid-century inspired tables and chairs, local beer and wine (much of it self-serve), nooks and crannies for chatting, a communal table atop animal skin rugs, and more glowing green banker's desk lamps than—well—an old timey bank. 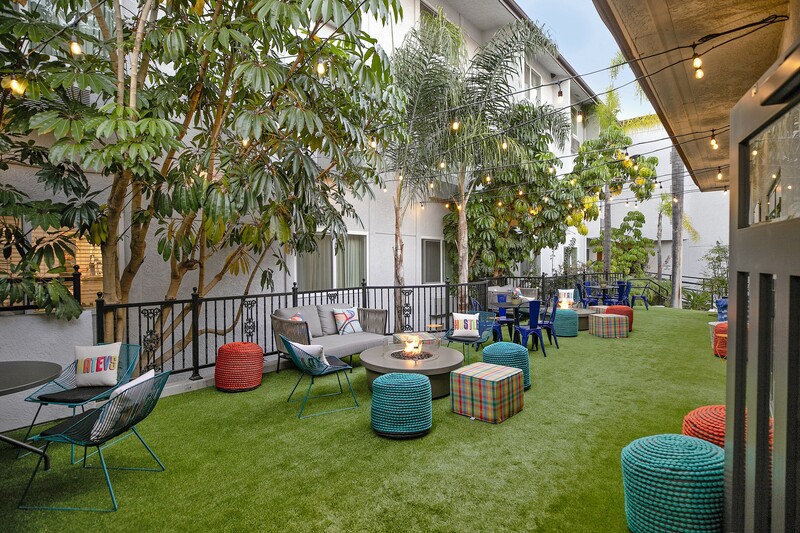 The 100-room sister hotel (the first Kinney is located in Venice Beach) is a new "social experience" brought to SLO from Southern California-based Pacifica Hotels. Leroy's was designed as a "contemporary gathering spot" featuring not just cute games, but also breakfast and lunch. 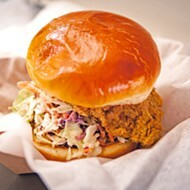 Think crowd-pleasers like the tri-tip bahn mi, IPA smoked bacon mac 'n' cheese, and a shiitake basil turkey burger. I stopped in for breakfast and was stoked that the chef went savory rather than sweet. Sure, I want to try the restaurant's Bananas Foster French Toast at some point in my life, but eating like this on a weekday would only mean napping straight through my deadline. 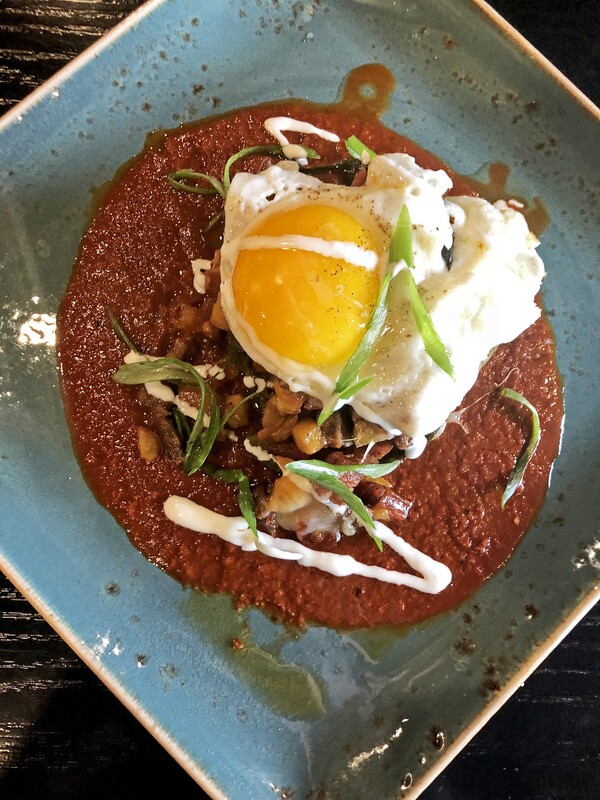 SUNNY SIDE Leroy's stuffed chile relleno is filled with tri-tip, bacon, and linguiça from Cattaneo Brothers, guajillo chili sauce, queso fresco, crema, and topped with a sunny-side-up egg. I gobbled down the stuffed chile relleno, a meaty spectacle to behold (see photographic evidence, right). Stuffed with tri-tip, bacon and linguiça from Cattaneo Brothers, guajillo chili sauce, queso fresco, crema, and a sunny-side-up egg, this messy meal got me through the day till supper. It was what the kids call "bomb." 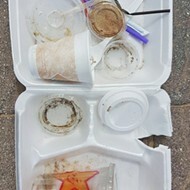 Luckily for Cal Poly students, this meal is available day and night! 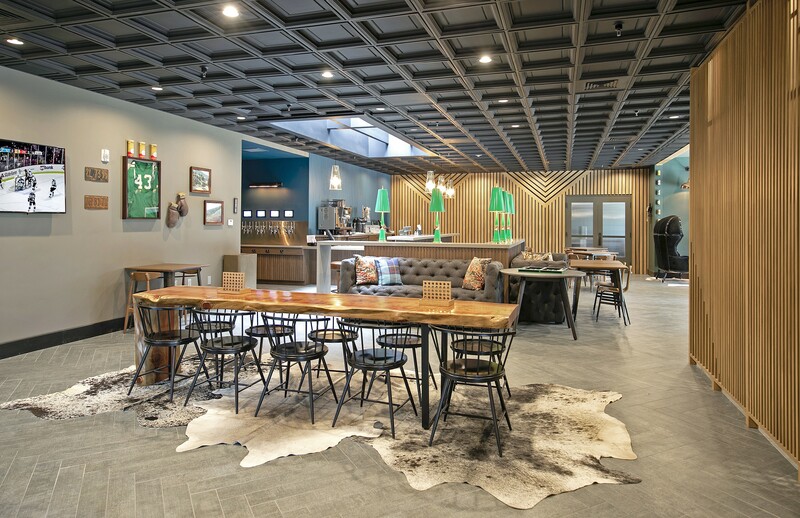 Kinney SLO manager Kristin Battaglia said the hotel was designed as an homage to Cal Poly—which makes sense, as the hotel and restaurant is just a stone's throw from campus. Old framed pictures show Cal Poly and SLO through the years; an ancient green jersey graces one wall. The property, previously a Holiday Inn Express, was entirely remodeled last year and opened to the public in October. "We wanted to bring in elements that are a nod to the community as well as encourage people to interact with the fun games," Battaglia said. "We want the restaurant to appeal to our guests staying here, but also to the community, too. We are open for the public to come in, and we want people to know that we're here. While there's a lot of excellent restaurants in the area, our menu sets us apart. We want to be unique and different, and you can see that in the presentation and quality." The charcuterie board features a giant soft pretzel with all the goodies incorporated within swoops of the dough: peppered salami, soppressata, prosciutto, cheeses, apples, grapes, blackberries, almonds (naturally, served with Pabst Blue Ribbon beer cheese). The burger looks like art. Students can even ask for the "secret menu," with a flash of their Cal Poly or Cuesta ID card (these items are weirder and cheaper). 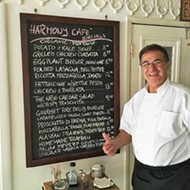 Leroy's chef and beverage director Adam Measurall, is local to the Central Coast, attending culinary school in Santa Barbara before working at a host of mom- and-pop restaurants across the region (including legendary Santa Maria-style steakhouse the Far West Tavern formerly in Guadalupe). Measurall signed on a few months ago, excited to start a new creative journey. "When I walked in, everything was still under construction and it was interesting to see the restaurant and hotel built from the ground up," the chef said. "It was a couple months in the making, including building out the extensive banquet menus. The menu is simple, but what sets us apart is the fact that everything is from scratch. We aren't getting chicken out of the bag. We are breaking down our own chickens, making our own chicken and veal stock. 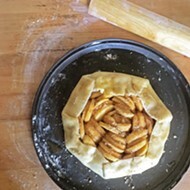 This is an approachable, from-scratch kitchen." Approachable like a game of giant Scrabble or table Boggle? I'd say so. Hayley Thomas Cain is making a clown face with the giant Lite-Brite. She can be reached at hthomas@newtimesslo.com.